To be able to choose the correct graphic format for a figure—whether it is a map, data plot or photograph—it is essential to understand that there are two types of format: vector, which consists of lines and other shapes, and raster, which consists of pixels (also sometimes referred to as dots). A vector graphic uses points, lines, curves and other shapes or polygons to represent an image. Vector graphics have three particular advantages compared to raster graphics: file sizes are smaller, an image can be rescaled to any size without loss of quality, and text can be read and indexed by internet search engines. When rasterized for printing a vector graphic is equally sharp at all sizes. Figures such as maps and data plots are thus best prepared in vector format. 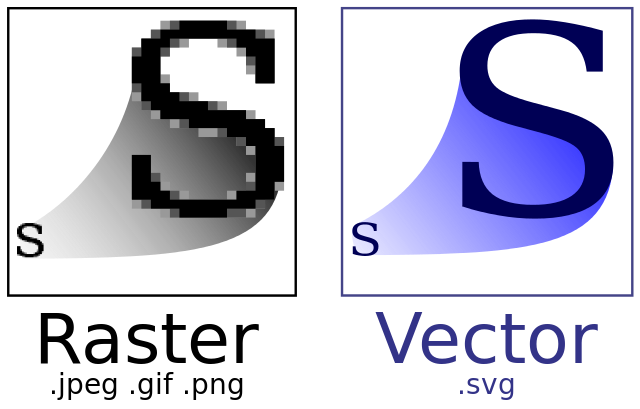 The standard for vector format is SVG (scalable vector graphics). Figures can also be prepared in postscript, a vector format that was originally designed for desktop publishing, although in our experience SVG produces more consistent results. A digital photograph is typically in raster format, as is the on-screen rendering of text and pictures in this guide, and the paintings of the Pointillism school of art, in which dots of colour are applied to form an image. There is a wide variety of raster formats. The images in this guide are in JPEG (Joint Photographic Experts Group) format. This format is commonly used for displaying a graphic on a screen as it allows an image to be compressed in size (and thus display quickly) yet maintains a reasonable image quality. Publication quality raster graphics (typically photographs, which are often referred to as plates) should be presented in TIFF (tagged image file format), which stores image data in a lossless way. This means that, unlike images in JPEG format, a TIFF image can be edited and re-saved without losing quality. TIFF images may be very large but can be compressed to a relatively small size without loss of quality (e.g. by zipping), and can include tags for geographical location (geoTIFF). TIFF files need to be provided at a resolution of 600 pixels per inch (commonly referred to as PPI) to achieve clarity and sharpness. Although often used interchangeably, the term pixels per inch should not be confused with dots per inch (commonly referred to as DPI), which is used to describe the number of dots per inch in a print from a digital file.